Spring Loop / Clip-on 180° Fisheye Lens for iPhone / iPod / Sony / LG / HTC Camera Phones : allputer.com - Accessories for all your Portable Electronics & Computers! 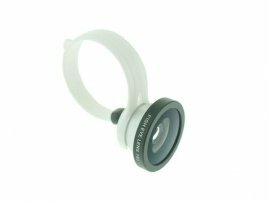 This lens uses the same optics as other fisheye selling in our shop, but it has a novel attachment method: the plastic spring-loop. Rather than a purpose-made phone case or stick-on washers and magnets, the loop simply reaches around to apply spring tension. The tip of the loop has a rubber cap to give it a little grip and avoid scuffing soft materials. The lens similarly has a black rubber washer around its base to keep it from sliding around once in place on the camera. This lens should work on just about any device, provided it's between 0.6cm and 2.8cm thick and the camera lens is no more than 9mm in diameter. That means it should work with many laptop's built-in webcams as well as external models. - The specially designed Spring Loop / Clip-on plastic gives you all the advantages of the a magnet stick-on lens and a lens with a purpose-made phone case. - work for any device with a camera, please check out its specifications below. - This lens should work on just about any device, provided it's between 0.6cm and 2.8cm thick and the camera lens is no more than 9mm in diameter.